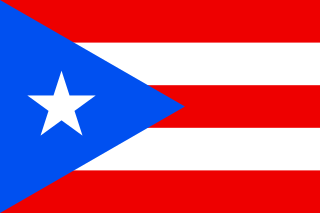 The Roman Catholic Archdiocese of San Juan de Puerto Rico (Latin : Archidioecesis Sancti Joannis Portoricensis) is an ecclesiastical territory or diocese of the Roman Catholic Church, comprising the northeast portion of the island of Puerto Rico, a commonwealth of the United States. 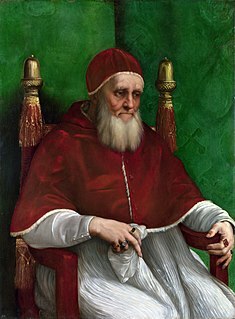 Pope Julius II, born Giuliano della Rovere, and nicknamed "The Fearsome Pope" and "The Warrior Pope", was head of the Catholic Church and ruler of the Papal States from 1 November 1503 to his death in 1513. His nine-year pontificate was marked by an active foreign policy, ambitious building projects, and patronage of the arts. His military and diplomatic interventions averted a take-over by France of the Italian States. He also proved a bulwark against Venetian expansionism. The Roman Catholic Diocese of Ponce is an ecclesiastical territory or diocese of the Roman Catholic Church in the United States and consists of the southern part of the island of Puerto Rico, a territory of the United States. The diocese is led by a prelate bishop who pastors the mother church in the City of Ponce, the Cathedral of Our Lady of Guadalupe. Its current bishop is S.E.R. Mons. Rubén Antonio González Medina, C.M.F. Its jurisdiction includes the municipalities of Adjuntas, Jayuya, Guánica, Guayanilla, Yauco, Peñuelas, Ponce, Juana Díaz, Villalba, Coamo, Santa Isabel, Salinas, Guayama, Arroyo, and Patillas. The Roman Catholic Diocese of Mondoñedo-Ferrol is the northernmost of the four Latin rite suffragan dioceses in the ecclesiastical province of the Metropolitan Archdiocese of Santiago de Compostela, which covers Galicia in North-western Spain. The area had previously been home to Britonia, a settlement founded by expatriate Britons in the wake of the Anglo-Saxon invasion of Britain. Britonia was represented by the diocese referred to as Britonensis ecclesia in sources from the 6th and 7th centuries. The Roman Catholic Archdiocese of Trujillo is an archdiocese located in the city of Trujillo in Peru. The Diocese of Badajoz was a Roman Catholic ecclesiastical territory in Spain, created in 1255. In 1994 it became the Archdiocese of Mérida-Badajoz. The Archdiocese of Valladolid is an ecclesiastical territory or diocese of the Catholic Church in Spain. It was erected as the Diocese of Valladolid by Pope Clement VIII on September 25, 1595, and was elevated to the rank of a metropolitan archdiocese by Pope Pius IX on July 4, 1857, with the suffragan sees of Ávila, Ciudad Rodrigo, Salamanca, Segovia, and Zamora. The Roman Catholic Diocese of Palencia is a diocese located in the city of Palencia in the ecclesiastical province of Burgos, Spain. The Roman Catholic Diocese of Málaga is a diocese located in the city of Málaga in the Ecclesiastical province of Granada in Spain. The Roman Catholic Diocese of Coria-Cáceres is a diocese located in the cities of Coria and Cáceres in the Ecclesiastical province of Mérida–Badajoz in Spain. The Archdiocese of Oviedo is an Archdiocese of the Roman Catholic Church in Spain. The archdiocese encompasses roughly the current autonomous community of Asturias or Principality of Asturias. Erected in the 9th century, the diocese was elevated to an archdiocese in 1954. The diocesan see is in the city of Oviedo, where the Catedral de San Salvador is located. The Roman Catholic Diocese of Calahorra y La Calzada-Logroño is a diocese located in the cities of Calahorra, Santo Domingo de la Calzada, and Logroño in the Ecclesiastical province of Pamplona y Tudela in Spain. The Roman Catholic Diocese of Córdoba is a diocese located in the city of Córdoba in the Ecclesiastical province of Sevilla in Spain. Bishop Demetrio Fernández González is the current Bishop of Cordoba. The Roman Catholic Diocese of Canarias or Diocese Canariense-Rubicense is a diocese located in the Canary Islands in the Ecclesiastical province of Seville in Spain. The dioceses includes the islands of Gran Canaria, Fuerteventura and Lanzarote. However, it does not include to the whole archipelago, since the Diocese of Tenerife or Nivariense, includes the Province of Santa Cruz de Tenerife. For this reason, the use of the name of the archipelago is currently a very controversial topic in the Canary Islands. It has recently emerged between the society of Lanzarote the desire to recover the diocesan headquarters of San Marcial del Rubicón. The Roman Catholic Diocese of Cuenca is a diocese located in the city of Cuenca in the Ecclesiastical province of Toledo in Spain. The Roman Catholic Diocese of Sigüenza-Guadalajara is a diocese located in the cities of Sigüenza and Guadalajara, Spain in the Ecclesiastical province of Toledo in Spain. It is in the located in the secular Spanish province of Guadalajara in Castile, central Spain. It is bounded on the north by Soria, on the east by Zaragoza and Teruel, on the south by Cuenca and on the west by Guadalajara and Segovia. 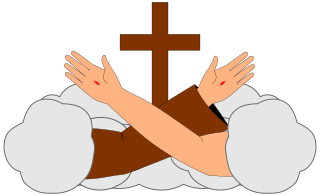 The Roman Catholic Diocese of Ávila is a diocese located in the city of Ávila in the Ecclesiastical province of Valladolid in Spain. The Roman Catholic Diocese of Segovia is a diocese located in the city of Segovia in the Ecclesiastical province of Valladolid in Spain. The Roman Catholic Diocese of Zamora is a diocese in the city of Zamora in the Ecclesiastical province of Valladolid in Spain. The Roman Catholic Archdiocese of Ayacucho o Huamanga is an archdiocese located in the city of Ayacucho in Peru. The Roman Catholic Archdiocese of La Paz is an archdiocese located in the city of La Paz in Bolivia. The Roman Catholic Archdiocese of Cartagena is an archdiocese located in the city of Cartagena in Colombia. The Roman Catholic Archdiocese of Ciudad Bolívar is an archdiocese located in the city of Ciudad Bolívar in Venezuela. 1 2 3 Herbermann, Charles G. The Catholic Encyclopedia: An International Work of Reference on the Constitution, Doctrine, Discipline, and History of the Catholic Church. Catholic Way Publishing. p. 292. 1 2 Schwaller, John Frederick (February 2011). The History of the Catholic Church in Latin America: From Conquest to Revolution and Beyond. New York University Press. p. 76. ISBN 978-0814783603. 1 2 3 4 "Federal judge decides that bankruptcy filing applies to all of Puerto Rico's Roman Catholic churches". Pasquines.us. 27 September 2018. Retrieved 5 October 2018. ↑ Márquez R.: "Puerto Rican poetry: a selection from aboriginal to contemporary times" Page 22. 2006. ↑ Cheney, David M. "Bishop Damián Lopez de Haro y Villarda [Catholic-Hierarchy]". Catholic-hierarchy.org. Retrieved 5 October 2018. ↑ "Bloomberg Law : Document : CATHOLIC SCHOOL EMPLOYEES PENSION TRUST, Docket No. 3:18-bk-00108 (Bankr. D.P.R. Jan 11, 2018), Court Docket". Bloomberglaw.com. Retrieved 5 October 2018. ↑ "Judge orders embargo of Puerto Rico Catholic Church accounts". Cruxnow.com. 27 March 2018. Retrieved 5 October 2018. ↑ "San Juan Archdiocese files for bankruptcy over teacher pensions". Ncronline.org. 30 August 2018. Retrieved 5 October 2018. ↑ "Judge: Bankruptcy applies to all Puerto Rico Catholic churches". Caribbeanbusiness.com. 7 September 2018. Retrieved 5 October 2018.